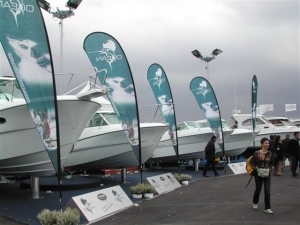 Turn every port of Call into a Port of Recall with Synergy’s On-Water Sports and Event Branding Solutions. 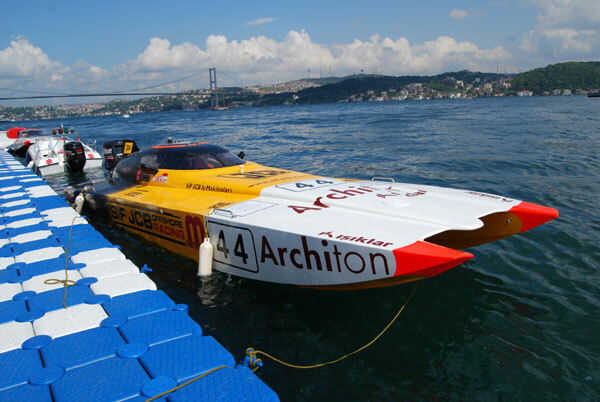 Bring your brand or advertising to life on or near water; rivers, lakes, inland waterways, ports, marinas, off-shore, beachfront, at regattas, races, maritime festivals, triathlons, golf course lakes… in fact anywhere you are on or adjacent to water or on land where you want to create a visible, impactful advertising presence. 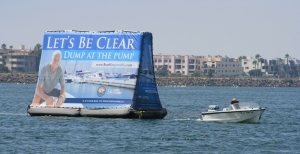 Bring your brand to life on land and at sea with amphibious billboards from Synergy. 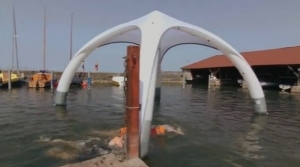 These reusable, inflatable A frames can be anchored in port, towed along the river, lake or shoreline, even positioned on beaches, car parks or rooftops to capture every line of sight. Graphics can be changed quickly and easily making the frames perfect for use at events & by sponsors year after year. 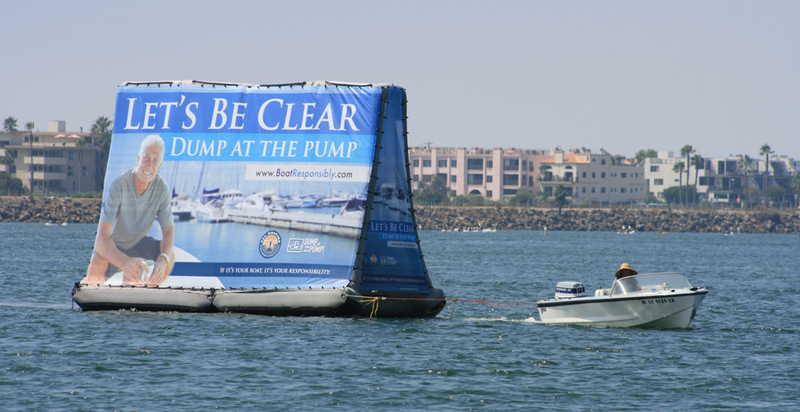 A unique On-Water Advertising Medium. These uniquely shaped wind-cheating banners will draw attention at any event. Use them for Advertising, Information Signing, Branding, recognizing Sponsors and creating a sense of theater and excitement at your event. Flexible and reusable, they can be quickly set-up, re-skinned with new artwork and used again and again for all your branding and marketing outings. The Ex-Disc is a great way to give your brand 360° impact and combines the practicality of the Boulevard Banner with the movement of the Flying Banner. This clever design allows the disc to feather in/out of the wind and the double-sided print shows off your brand from any direction. This means your banner will create a greater impact on more people. The image is also easily interchangeable. There’s a range of mounting options available for Ex-Disc Banners – both temporary and permanent. Look after your guests in style with this striking on-water hospitality event solution. 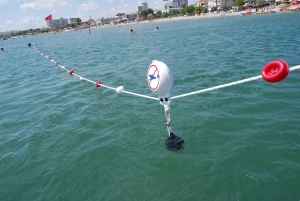 Create Marians, Jetty’s, Mooring platforms, access ramps, Helipads, Stages and Walkways… with these specially designed interlocking floating cubes. Each cube is 40cm high, every square meter is made up of four cubes, and the safe top load is 325kg. Our engineers and installations teams can help specify and set-up you requirements. 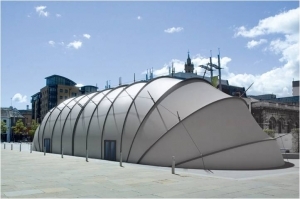 These futuristic branded shelters make the perfect eye catching all-weather covering for patrons, hospitality, mini-events, outdoor markets, trade show stands, Pop-Up shops and showrooms. They are ideal for enhancing the visual landscape of any event and can be used on land or in water. Made to international approved standards Line Separators & Barriers are supplied to your specification, option to add Ad-buoys that carry additional safety or Advertising branding. Part of any on-water events operational toolkit. 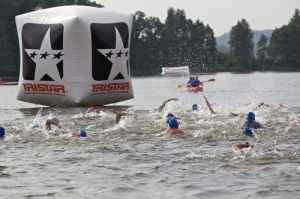 Bring your sporting or maritime event to life on land and at sea with Inflatable Advertising Markers. Specially engineered sealed-air inflatables designed to work on water these striking shapes can be branded or set up with Velcro interchangeable banners for maximum flexibility. Truly functional and with massive visual appeal inflatables are a great way to bring your branding into the heart of the on-water activity. 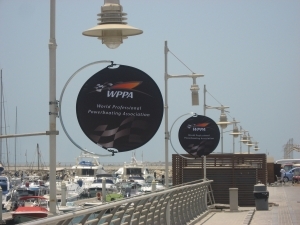 Ideal for branding along shorelines, ports and harbors, screening off non-event areas and around site perimeters. Offering all the benefits of PVC at a fraction of the cost, non-woven polyester banners are an innovative and an extremely cost-effective replacement for PVC on longer print runs. Synergy’s continuous bannering is very light but equally very strong and provides a durable substrate on which to print bold vibrant colors. Non woven polyester banners are wrinkle resistant so maintaining its appeal over time and it can be washed to restore appearance if necessary and reused at future events time and time again; limited reflection or glare off the material makes the cloth suitable for TV coverage and Press photography. 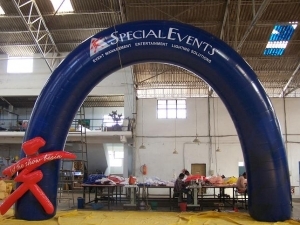 Inflatable’s Grab Attention, Increase Brand Awareness and Connect on an emotional level with Consumers. All our Inflatable Arches are designed to act as eye-catching, standout attention grabbers and are highly effective outdoor site or event markers, imposing START/FINISH or site entrance gantries and unmissable customer touch-points. They can be made in all shapes and sizes and branded up to reflect your product, packaging, a character, theme or corporate identity. Arches are great for TV, Photo and PR Opportunities. Look after your guests in style on land with this striking hospitality event enclosure. Our Floating Dock systems are the strongest and the most stable polyethylene plastic floating docking systems for residential and commercial use. Whatever the dock application — residential, commercial, special event, or branding — floating docks are the best solution and are attractive, versatile, and low maintenance, thus improving the setting of waterfront and making it easier to manage. 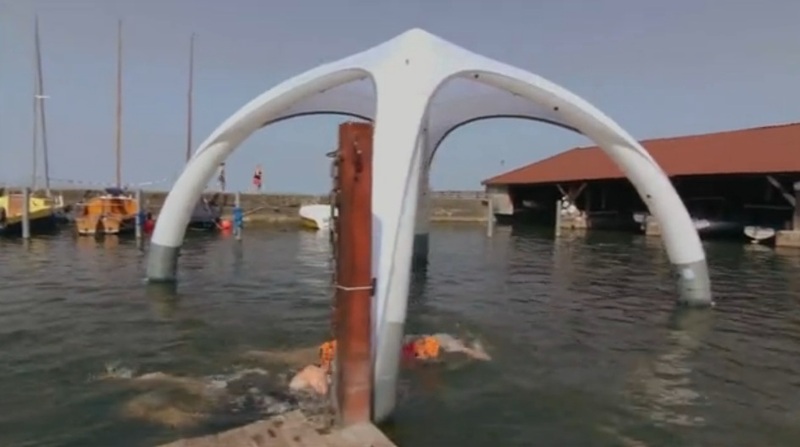 Whether the goal is extra leisure time or more profit for business, floating, modular, composite docks and accessories offer advantages like no other: unbeatable adaptability, exceptional performance in rough water, superior strength and durability, virtually no upkeep, universal accessibility, ease of installation. 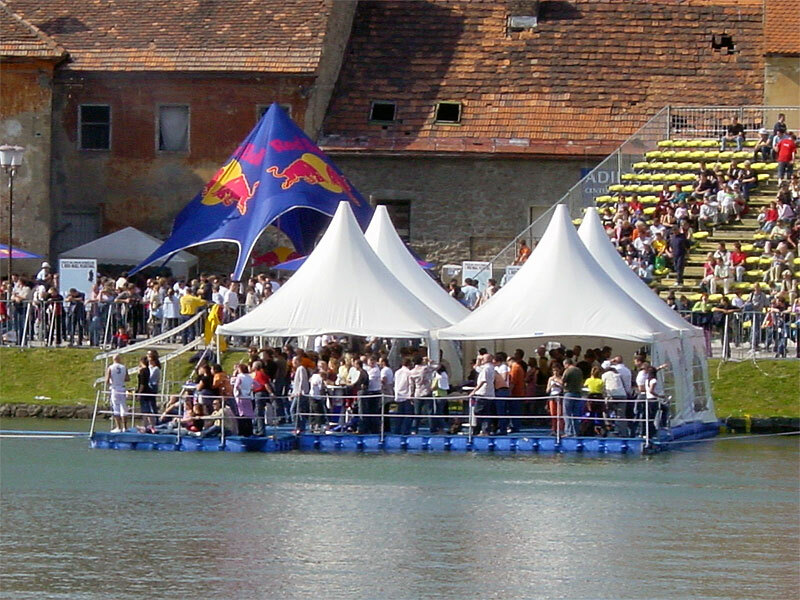 Activate your branding and offer your brand & sponsors even more ways to maximize their presence at events, especially on-water. It’s all plain sailing with Synergy!